A few days ago it was 7 months since Freddie was born. I’m in a strange place right now; I think that I’ve become so embroiled in ‘life’ – my job, mostly – that it’s become easier to separate myself from what really happened. I have found myself purposely not ‘trying’ (to conceive) over the last couple of months, and I think it’s because it’s easier to fail from not trying, that to try and fail. I think that it’s easier to convince myself and others that I am not really that person, that this is not really my life, and that actually, childless and chunky is how things are supposed to be. But, I’m finding that the ‘symptoms’ of my situation are here worse than ever. If you watched carefully and knew a thing or two, you might piece together the bits; such as my choosing not to eat in the school canteen, for reasons such as my diet (they do sell salad…) or wanting some peace and quiet (which is partly true), or missing things off my grocery list because I forgot, or avoiding making contact with certain people, all for reasons easily explained away to the unknowing, when actually the reason is that I cannot endure the stress of being confronted by a pregnant woman, or a newborn baby. I cannot think about a pregnant woman or a newborn baby. So I avoid the aisles with the bumps and the slings and prams, and the school canteen which may or may not contain one of the seeming hundreds (of course there are not hundreds…) of pregnant women, and the conversing with anyone who is, or knows someone who is pregnant. This may also be the reason why I have stopped trying; to be trying to conceive brings to the fore all of those things with which I cannot cope, and so it is easier to pretend to be – or even to actually be – someone else; someone who is not trying for a baby, or still trying to lose ‘baby weight’, or any of the things which have resulted from what I have been through. But I am not quite convinced. And I know as I write this that I cannot expect NOT to see pregnant women or babies around – the rest of the world goes on, blissfully unaware of the horrific, tragic, get-wrenching mess that is the world of one who has lost two children – and why shouldn’t it? I still feel the ‘flutters’ in my stomach. I still feel as if I have been punched in the gut when the stark image of Sam holding Freddie invades my mind. I still have not moved, nor can bear to look at for more than a few seconds, the tiny clothes in blue and green, emblazoned with frogs and dinosaurs and trucks, in the small white wardrobe, or the little drawers in the spare room. 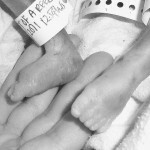 I am the mother of a little girl, and a little boy, both of whom were taken before they took a breath on earth. I have a Beagle called Arthur who tries his best to substitute, and a husband who must love me more than I can describe, (other than by saying that he cleans without me asking him to, and never, ever says anything mean to me). My baby girl arrived at almost 19 weeks, and of course, did not survive. A year later, my baby boy – Freddie – arrived at almost 25 weeks. One week after the fluid that babies need so vitally, had left him, Freddie passed away, and was born not long afterwards. My love for them both will never wither. My very being is fractured by the loss of my babies. It is difficult to write and will be difficult for many of you to read. This is my narrative. Danielle on One Whole Year.